The SIP system that we use is of the highest quality, and is what allows the full thickness of the frame to be exposed in all its beauty. 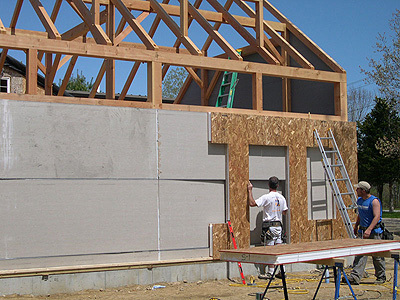 The panels do not limit roofing, siding or interior finishes. SCPB specifies and configures custom precision cuts on our computerized CNC machine for each frame, including window and door openings. This process lends itself to a smooth, organized and efficient site assemblage. The accuracy and reliability obtained are, both time saving, and cost effective. After more than 30 years of designing and building, we have excelled and progressed in our building systems and methods of construction. 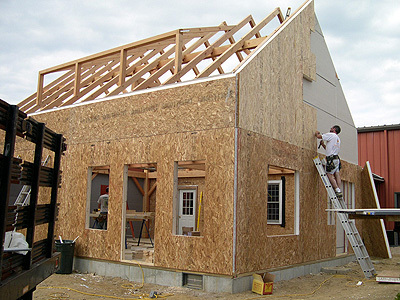 At one time, electrical wiring and systems location posed a challenge to the timber frame structure, but, through our research, we have developed accessjoist TM. Accessjoist TM is our proprietary, cavity floor system which will accomodate such challenges. For more information on cutting and installation options please contact us.